States with new poll data added since the last update: Wisconsin, Florida, Ohio, Indiana, New Hampshire, Iowa, Virginia, Colorado, Alaska, Washington, Michigan, Arizona, Tennessee, Maryland, Massachusetts, Oregon, Illinois. Notable changes in: Michigan and Arizona. As of this update, the most recent polls included in the state averages ended on Thursday. That means that as of yet we do not have any polling that would show the impact (or lack thereof) of Friday’s release of 2005 era Trump recordings that have dominated the news since then. Clinton expands her expected win by taking the lead in Arizona. 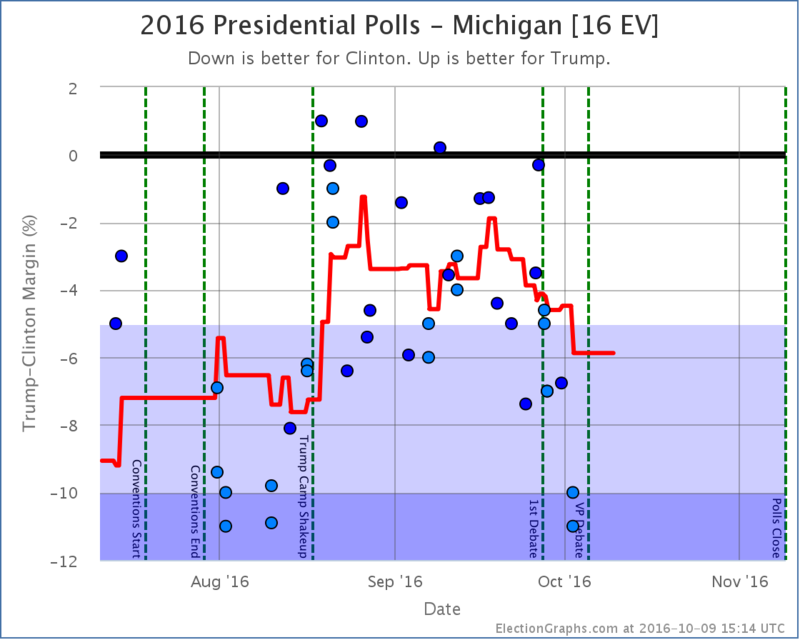 But perhaps more notable at this point is that her lead in Michigan expands to 5.9%, moving it from my “Weak Clinton” category into “Strong Clinton”. Without Michigan, Trump no longer has a path to victory. He can win all the states he is ahead in, plus all the states where he is close (North Carolina, Arizona, Florida, Ohio, Iowa, and Nevada) and he would still come up short, losing to Clinton 272 to 266. In order to win, Trump would need to not only pull all of those close states over to his side, but also reverse his fortunes in Michigan or other states where he is currently not just behind, but significantly behind. 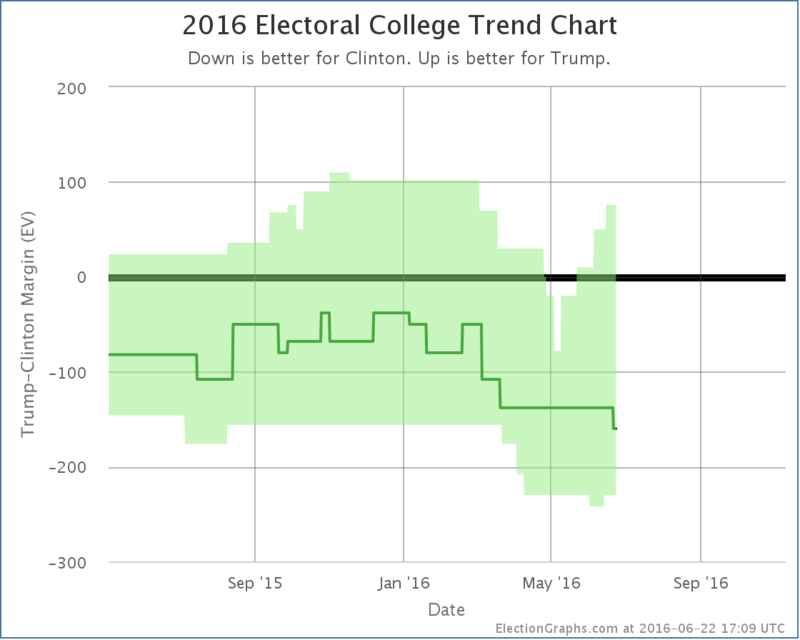 Now, with all this, Trump’s numbers are actually still slightly better than he was doing at Clinton’s high water mark in mid-August. Trump came back from that and moved things to the point where he had almost tied the race. Can’t he do that again? Well, look carefully at that recovery. 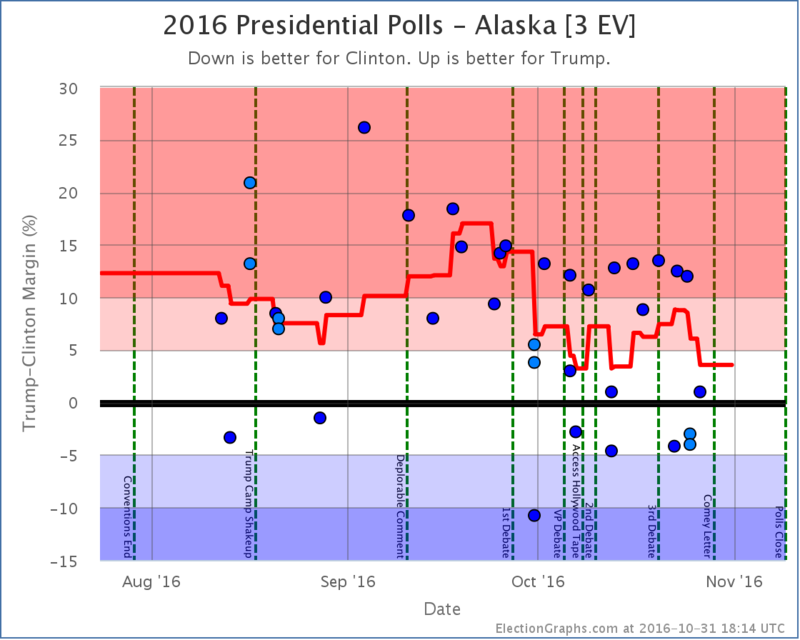 From Trump’s low point, it took about a month to reach the point where he had almost tied the race. A month. We now have 30.3 days left until polls start to close on election day. Many people have already voted. Early voting is ramping up quickly in state after state. In order to catch up and win, Trump would have to have a recovery that was more significant… and quicker… than the successes he managed in August and September. 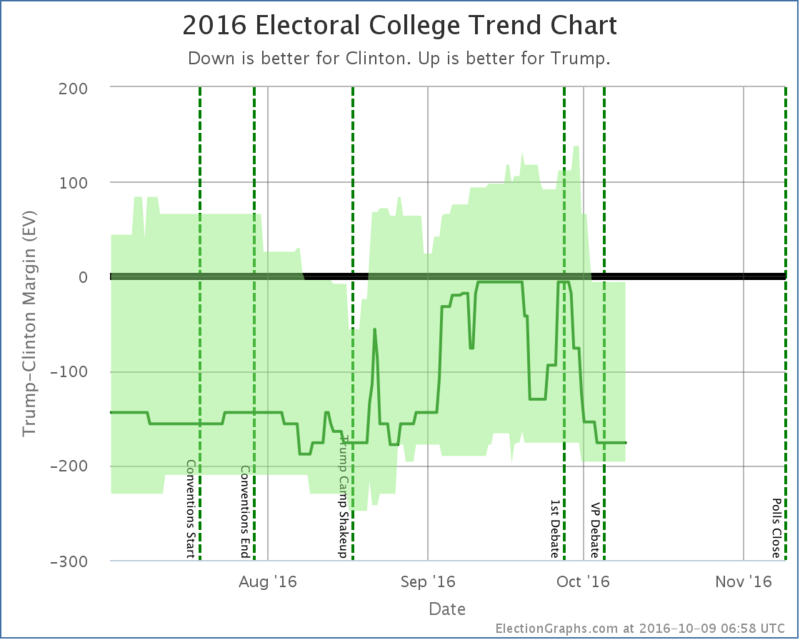 For any reversal, Trump has to pull out of the tailspin first… and the polls don’t yet reflect the latest major campaign events. Things are likely to get worse for Trump before they get better. If they get better. He is running out of time. It may already be too late. As I write this the 2nd Presidential debate is in just a few hours. Hang on tight. 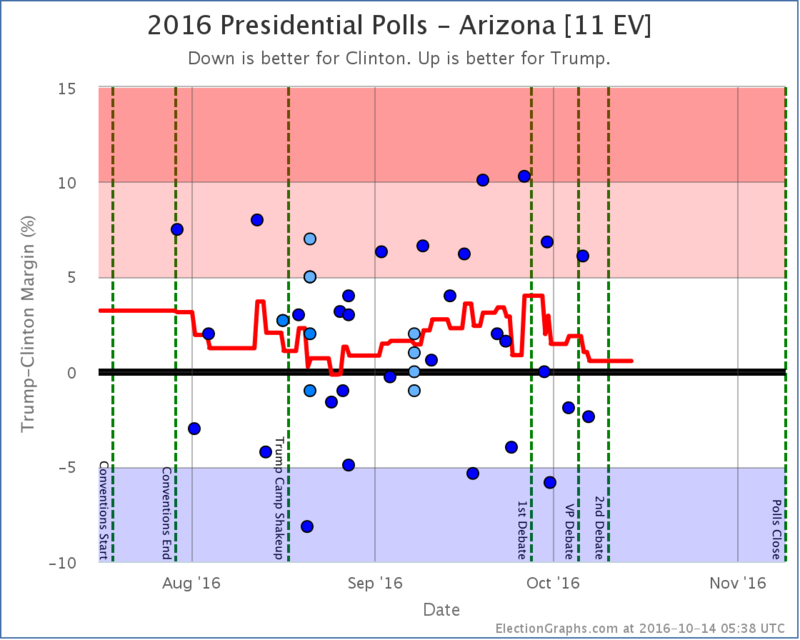 Four of the five polls in the average right now have Clinton tied or ahead in Arizona. All three post debate polls do. Clinton’s lead in the average though is a very narrow 0.3% though. 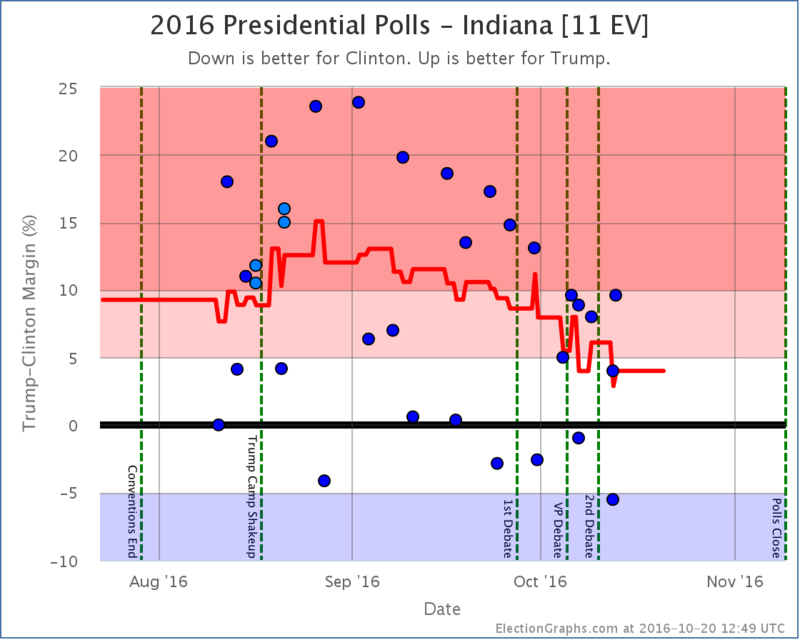 Trump could very well take the lead again with the next poll. 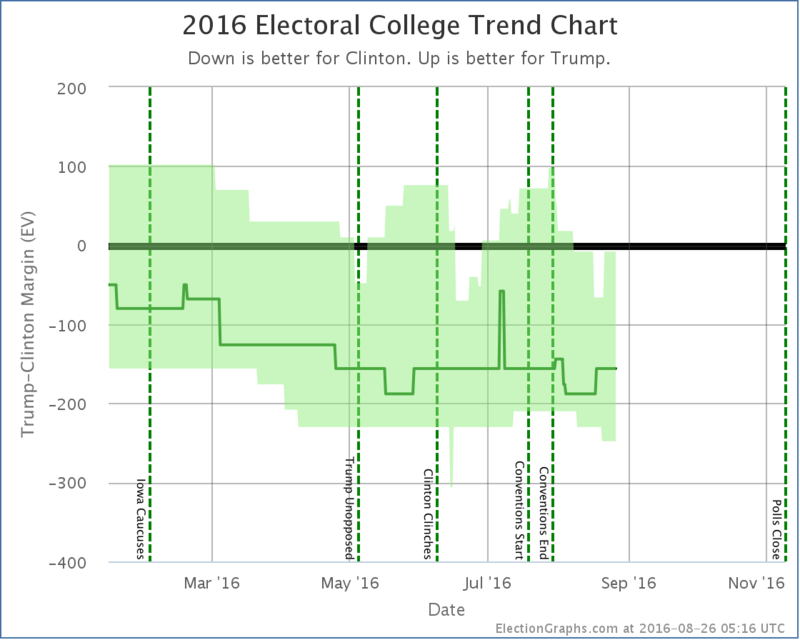 Movement away from Trump is visible starting in mid September. 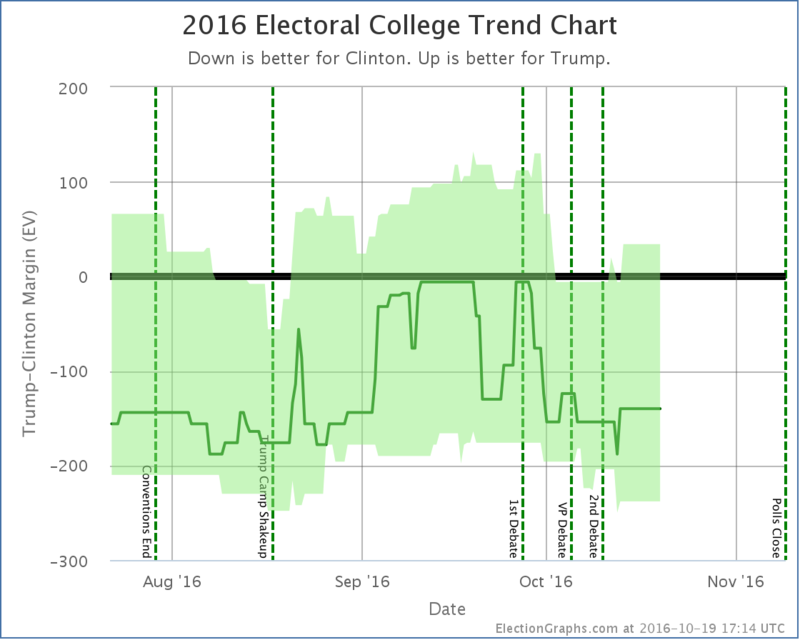 Trump’s debate performance did nothing to change this trend. Clinton now holds a fairly substantial lead in Michigan. 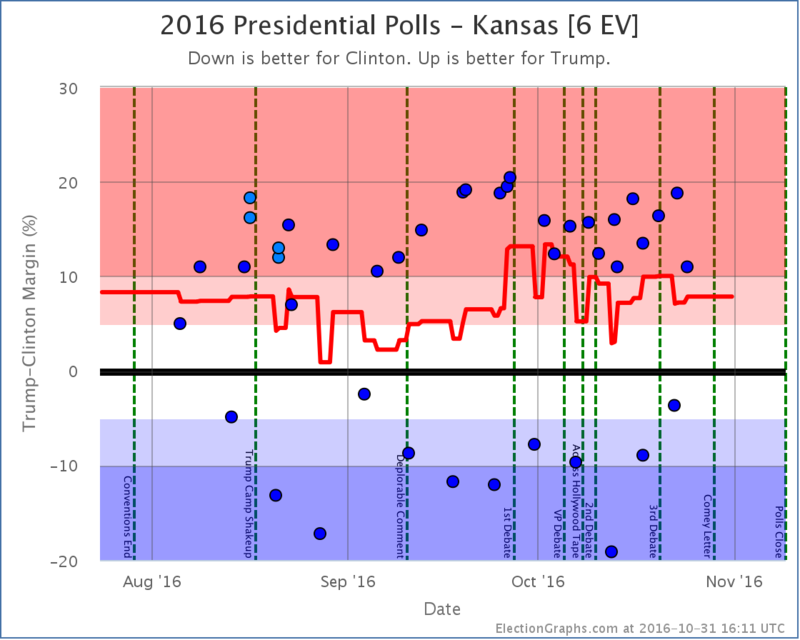 Wow, that is a lot of new polls. While there were some others, the big influence today is that Reuters/Ipsos has started to do a weekly nationwide tracking poll where they provide state breakdowns for any state where they have enough data. So from now until the election we should start getting regular data on a lot of states that usually don’t get polled. Ever since April Arizona has been looking like a possible target for Clinton… Trump ahead, but with only a narrow lead that Clinton might be able to flip. With the latest updates, Trump’s lead in the average increases to 5.5%, so we take it out of that category. The notion of a blue Arizona slips away from Clinton. Honestly, it looks like an outlier, but the most recent of those Reuters/Ipsos results I mentioned show Trump with a huge 14% lead in New Hampshire. The second best number in the average shows Clinton up by 2%, and that is also from Ipsos. 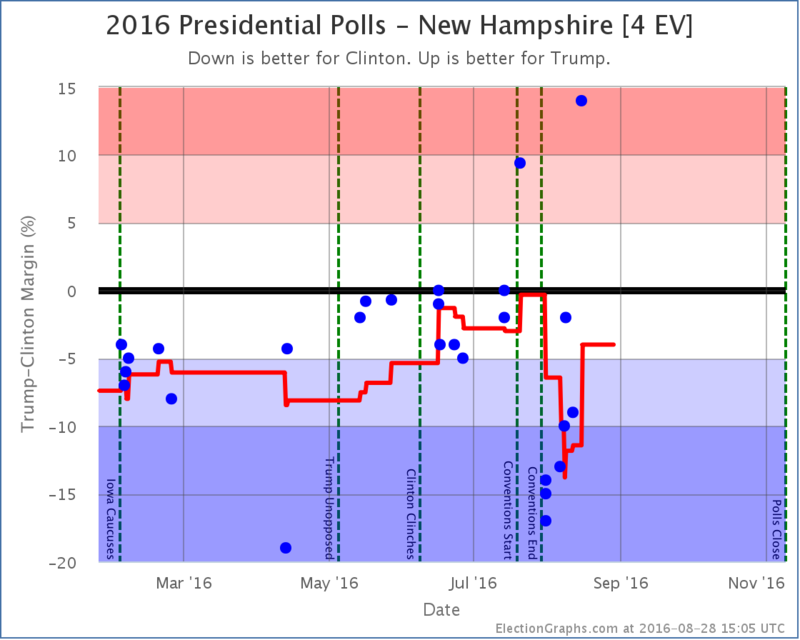 All the other recent numbers in New Hampshire show a Clinton lead of at least 9%, and there has been no radical change in the campaign that would indicate a huge swing would be expected. If these two Ipsos data points are really outliers, then new polls should quickly show that. 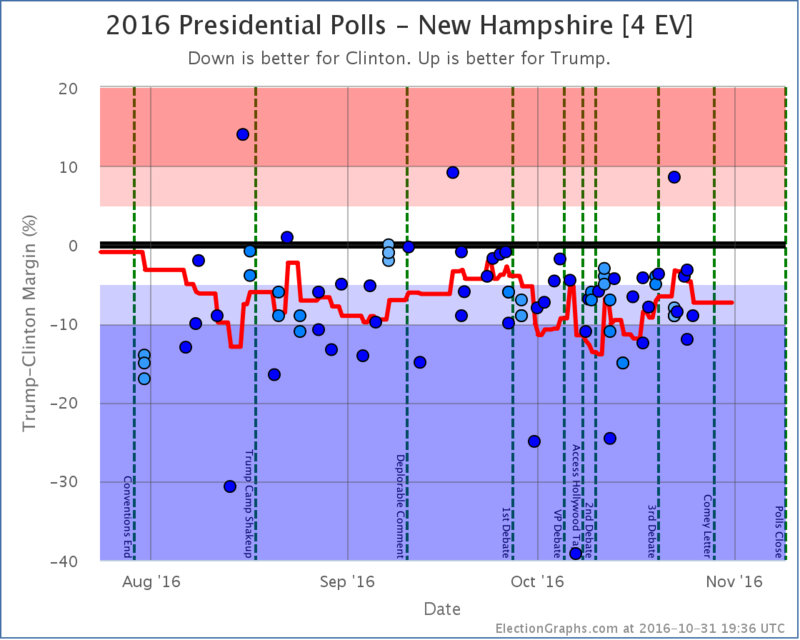 For the moment though, the average moves to only a 4.0% Clinton lead due to the two Ipsos data points, so New Hampshire is once again categorized as a state Trump has a chance in. Maine has been pretty sparsely polled this Election cycle, but what polls we do have show the state trending away from being a solid blue state to being close. 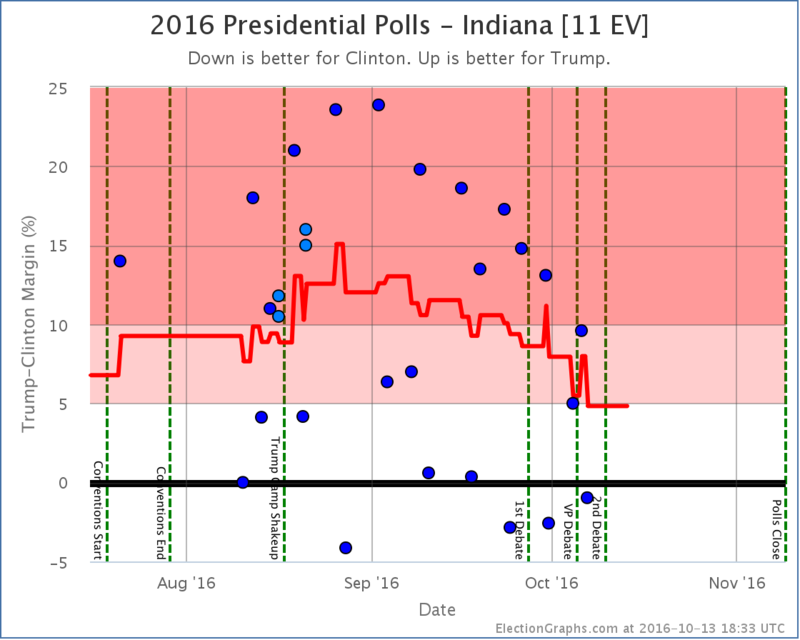 The latest couple of results (both Ipsos) have Trump ahead, as have a few previous polls. 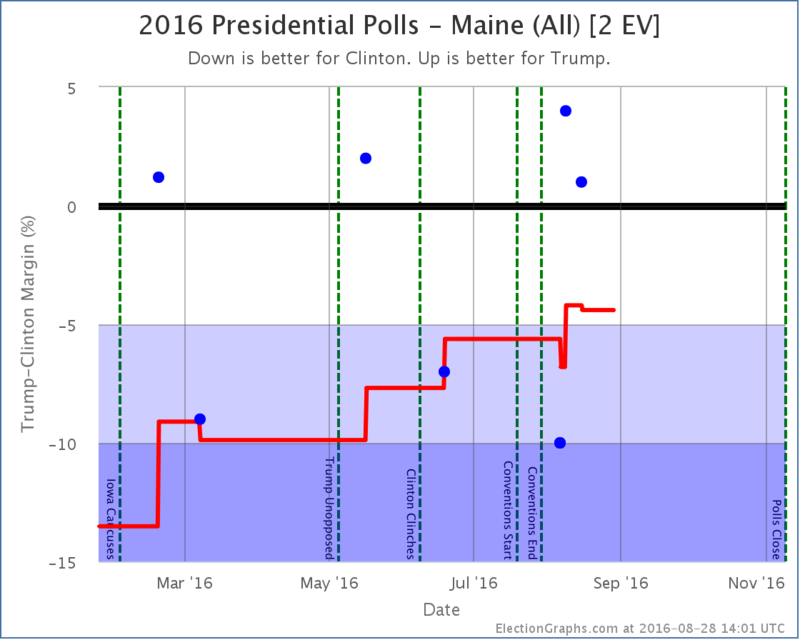 The average is now only a 4.4% Clinton lead, so Maine is now in the “Weak Clinton” category, and it is included in Trump’s best case. Now, Maine is one of the two states that splits electoral votes. For winning Maine at large, you only get 2 electoral votes. You then get 1 electoral vote for winning each congressional district. 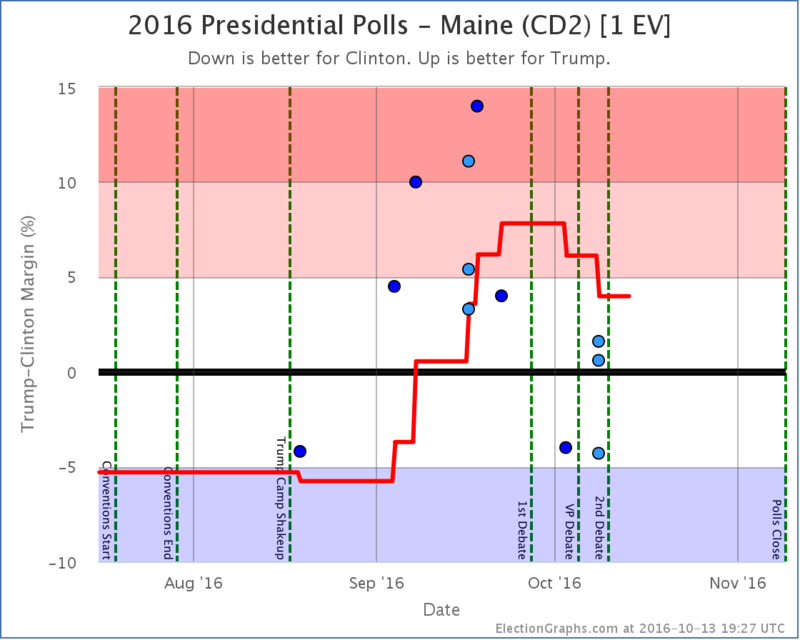 Now, mathematically, for Maine as a whole to have a 4.4% lead for Clinton, Trump would have to be doing even better than that in one of the two congressional districts. But right now the average in CD-1 is a 15.8% Clinton lead and in CD-2 it is a 5.3% Clinton lead. That can’t be! You would expect CD-2 to be Weak Clinton as well, or possibly even Weak Trump. The problem is that while there has been very limited polling of Maine as a whole, there has been even less polling of Maine at a Congressional District level. There has only been ONE poll of Maine CD-2 this election cycle. It was in June and showed Trump up by 1%. 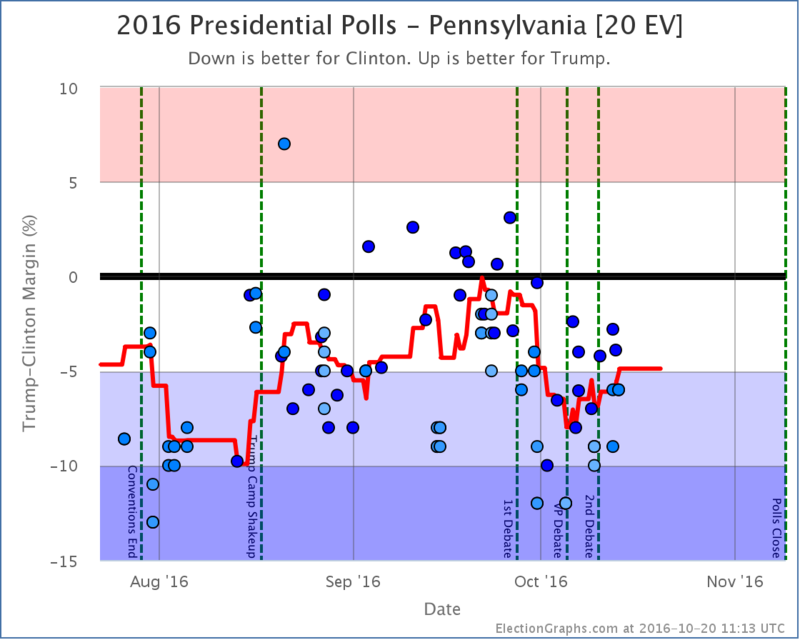 The average is 5.3% Clinton because in order to fill out the average when there are less than five polls, I use previous election results. New polling in Maine CD-2 is currently what I classify as the “Most Needed Poll” (followed be NE-2, NE-1, ME-1 and SD). 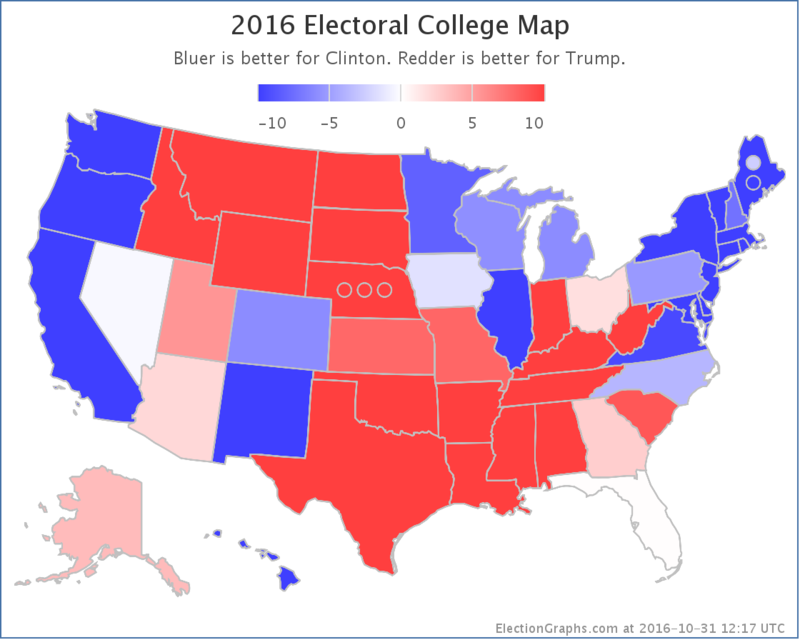 Right now we don’t have enough polling evidence to show that CD-2 is actually Weak Clinton or Weak Trump rather than Strong Clinton, but given where Maine as a whole is, the ME-2 electoral vote has to be a possible pick up for Trump too, but it won’t be categorized that way here until there are enough polls backing that up directly. 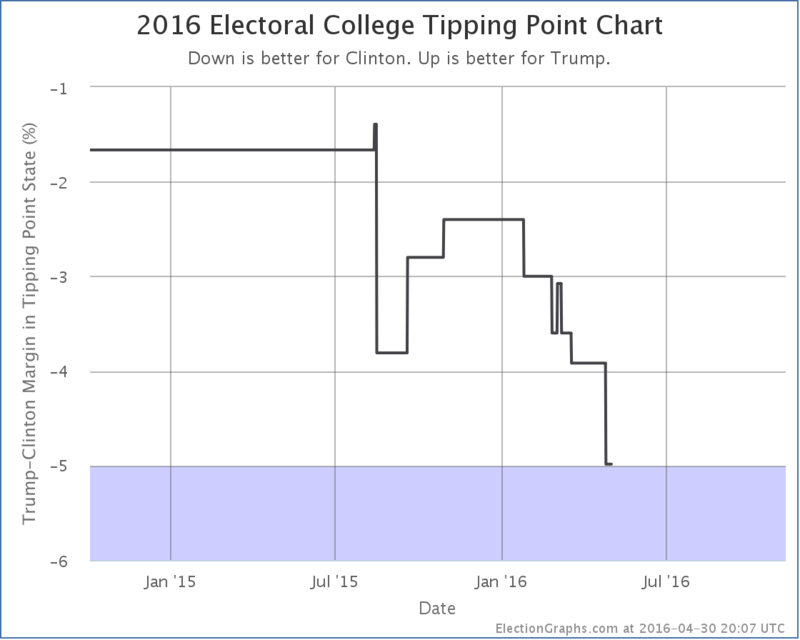 Before showing the new national trend chart and tipping point charts, a quick note. 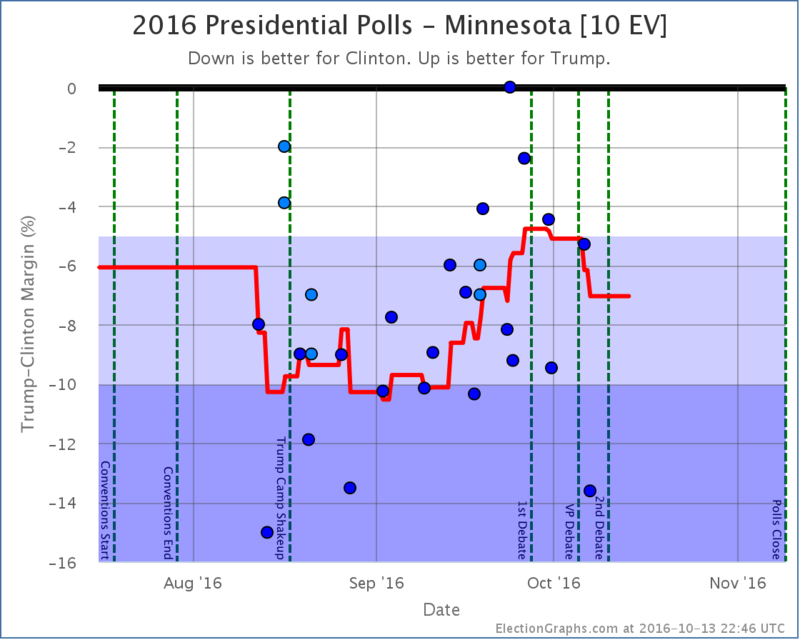 In addition to the new polls added in the most recent batch, I found a handful of older polls that I had somehow missed earlier in the year. These don’t change the current picture, but they change the past. 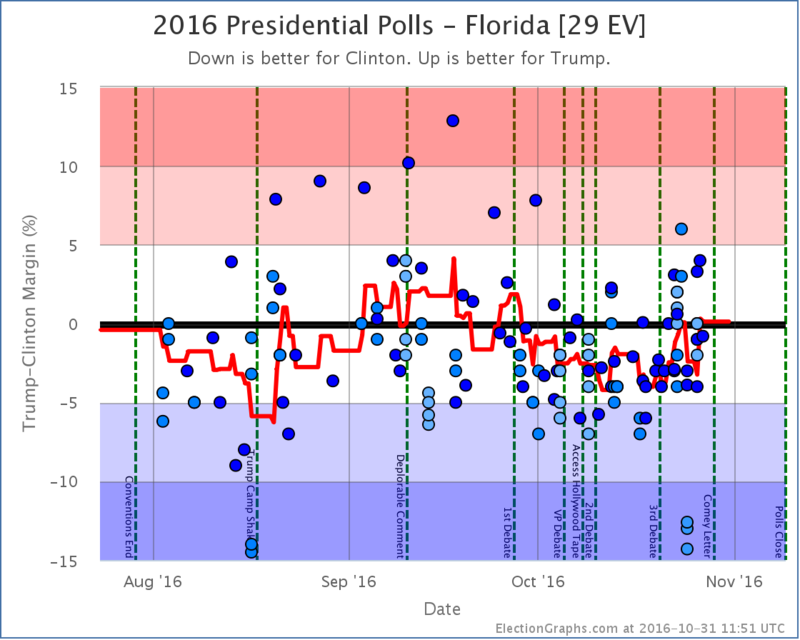 Specifically, Trump’s position in the spring was significantly weaker than it looked at the time, mainly because Florida would have slipped out of his reach significantly earlier. 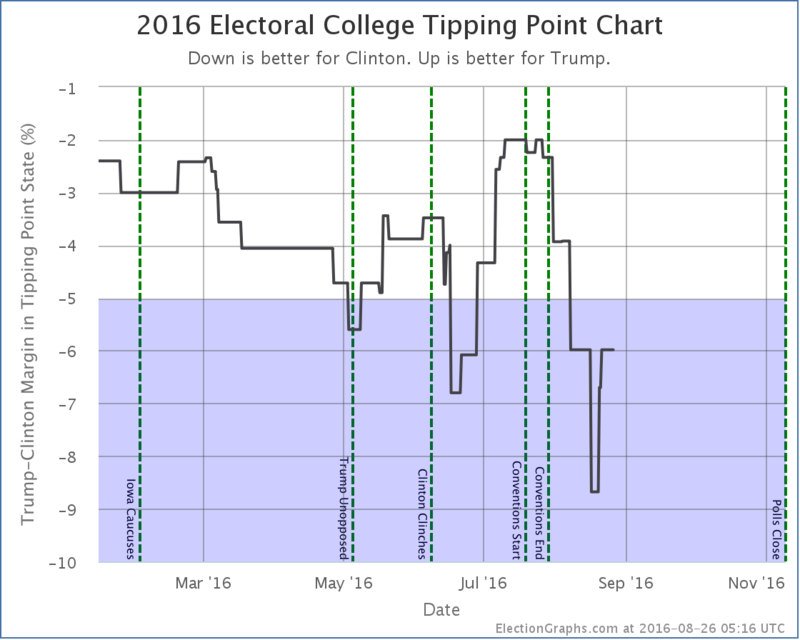 Note that in addition to the bumps upward in Clinton and Trump’s current best cases, Trump’s best case in the spring is significantly depressed, enough so that his best case moved from a narrow win in most of April to a narrow loss. There are some other subtle differences between these two caused by the addition of these old polls I had missed at the time, but that is the big one, caused essentially by one March poll in Florida that I did not see until August. Apologies for that. 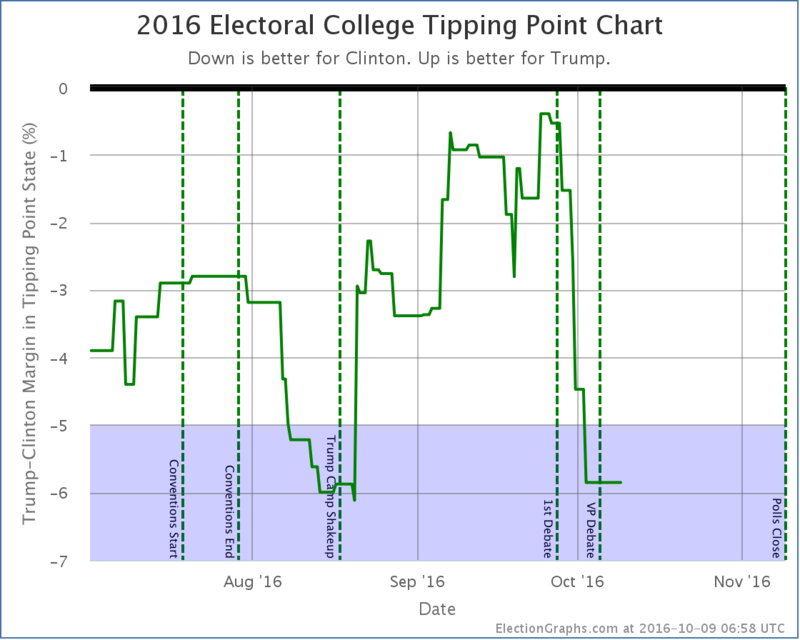 The difference in the tipping point graph is even more dramatic, with Florida worse for Trump than it previously looked, there was a lot more room for the tipping point to wiggle, and it was a lot worse during the spring than it looked. 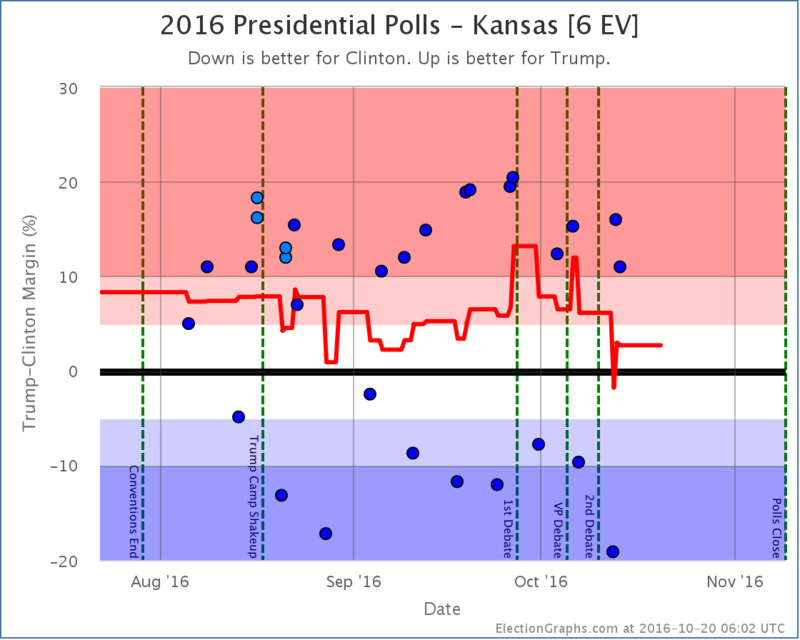 Again the main impact is that the “missing polls” that I added make it clear that Trump was significantly worse off in the spring than I had shown at the time. In fact, it means that at the end of April he was actually below his recent bottom in mid-August. OK, enough hand wringing about things that may have been missed in the spring. 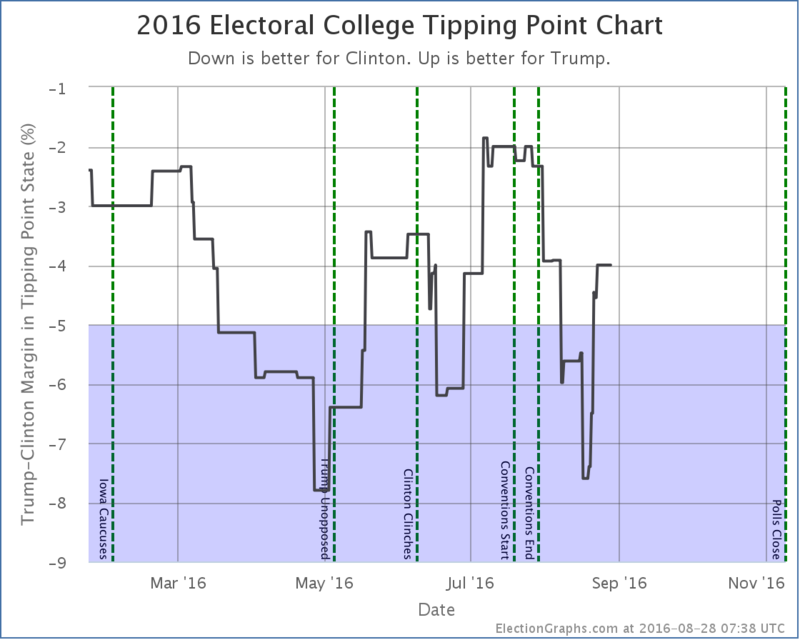 The big current news on the tipping point is that with changes in the averages in Michigan, New Hampshire, and Ohio, the tipping point comes roaring back in Trump’s direction. In this update it moves from a 6.0% Clinton lead in Connecticut to a 4.0% Clinton lead in New Hampshire, but this is a full 3.6% swing toward Trump since his low of 7.6% about 10 days ago. 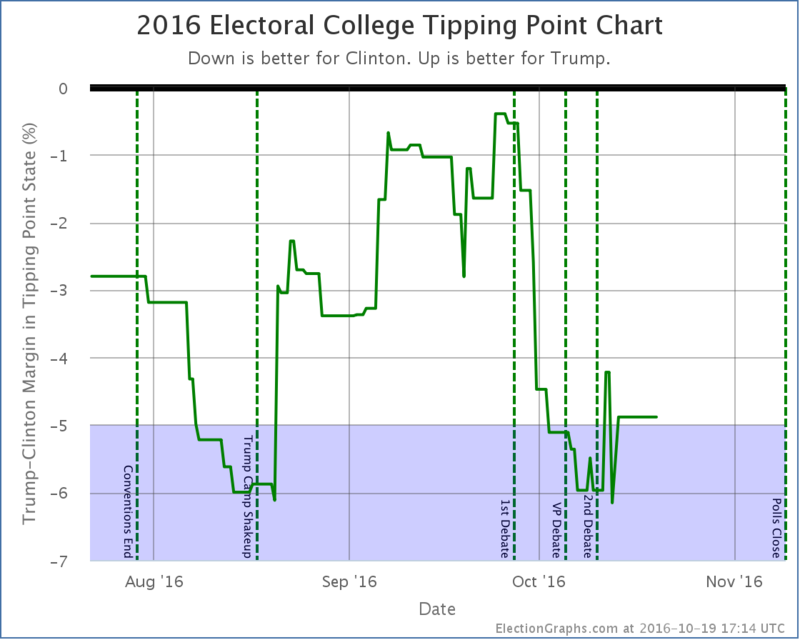 Now, everything above still shows a Trump loss, but it is looking a lot closer than it did a couple weeks ago. The first part of August was disastrous for Trump, but he has been bouncing back since then. He is still very far behind, but maybe his latest reworking of his campaign is working. His best case is once again to win, although by a very narrow 4 electoral vote margin. 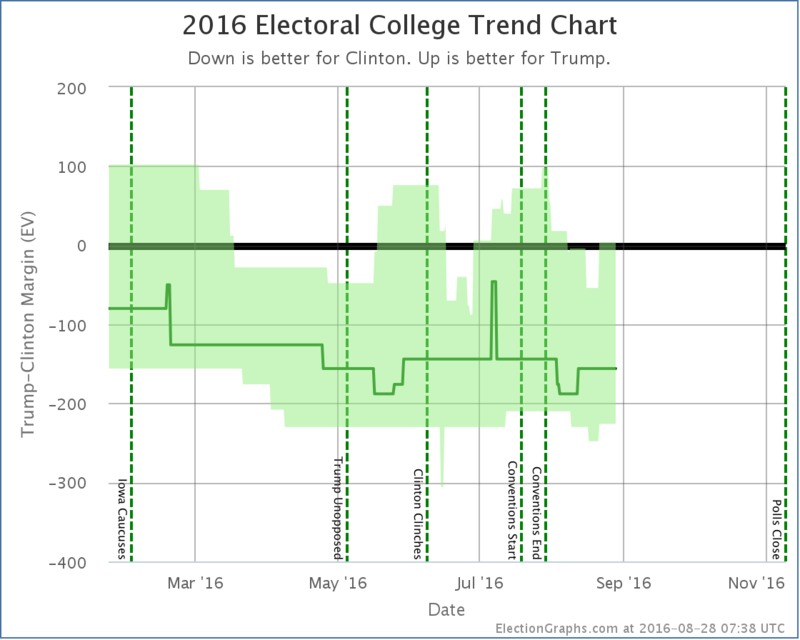 Will the recent trend continue and make this race look even closer? 72.2 days left for him to do it. Notice on Methodology: In my August 13th update I solicited opinions on possibly changing how this site deals with the case when a pollster releases multiple results from a single poll. See the discussion in that comment thread for more details. Immediately after this post goes live I will be working to change the site logic so that if two results are released from a poll, each counts as only half a poll for purposes of the averages here. Similar logic will apply to tracking polls where samples overlap, but not completely, with polls weighted to reflect the fraction of the new result that is actually from a fresh sample. As examples of the impact this could have, the three states mentioned in this post would change as follows: Arizona is a 5.5% Trump lead (Strong Trump) with the current logic, it would be a 3.9% Trump lead (Weak Trump) with the new logic. New Hampshire would move from a 4.0% Clinton lead (Weak Clinton) to a 8.4% Clinton lead (Strong Clinton). Maine (All) would move from a 4.4% Clinton lead (Weak Clinton) to a 3.7% Clinton lead (Weak Clinton). With these three examples, two of the changes favor Clinton, and one favors Trump. New polls since last update: Texas (x2), Arizona, Iowa, New Hampshire, Ohio, Pennsylvania, Wisconsin. Well, that didn’t last long. 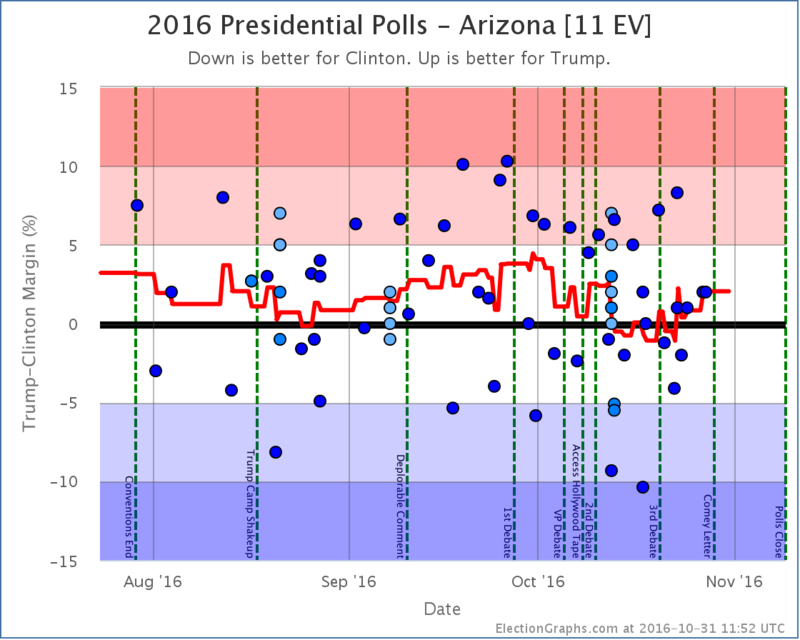 Less than a week ago the polling average in Arizona moved to the blue side of the center line. With today’s update, Arizona is once again tinted the more familiar red color. 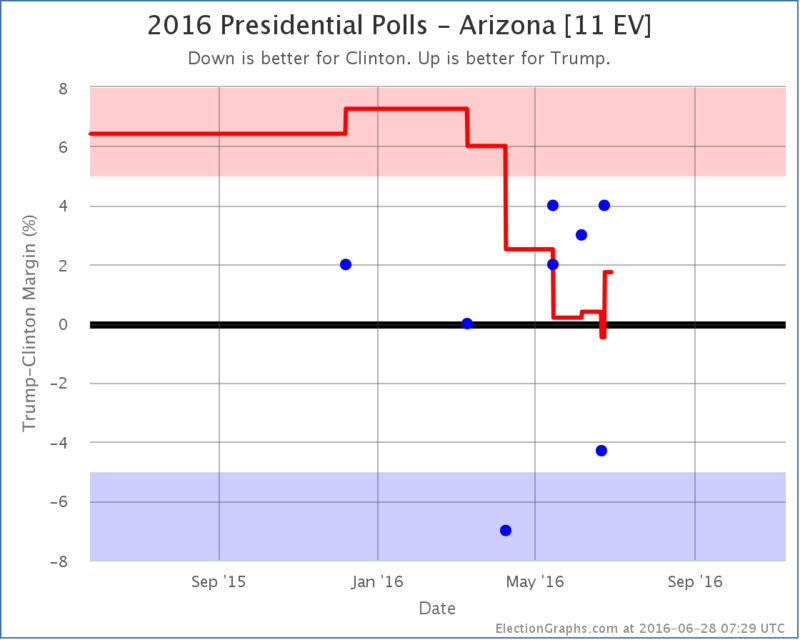 One of the two polls showing Clinton leading in Arizona falls off the average, and so it rises to a 1.7% Trump lead. 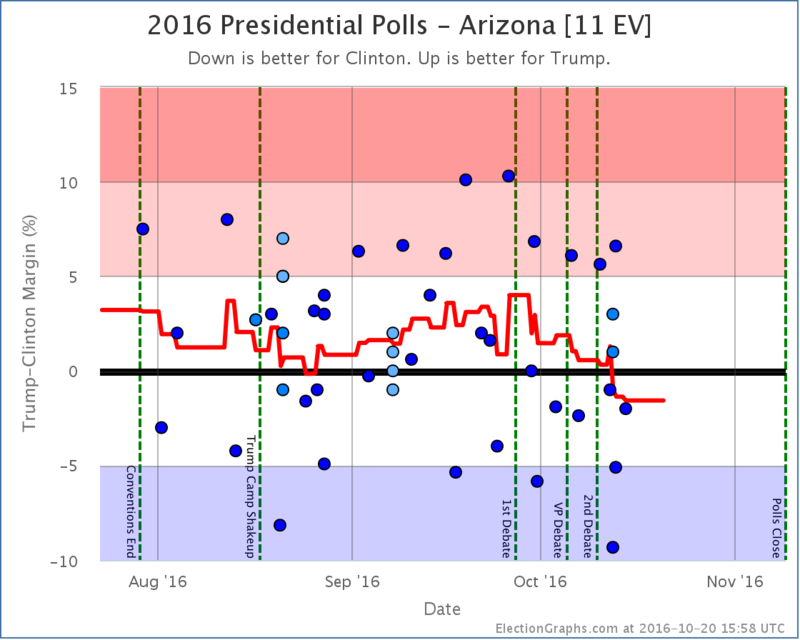 Arizona is still looking close, which is itself remarkable given the electoral history there, but once again it is on the Trump side of the line. 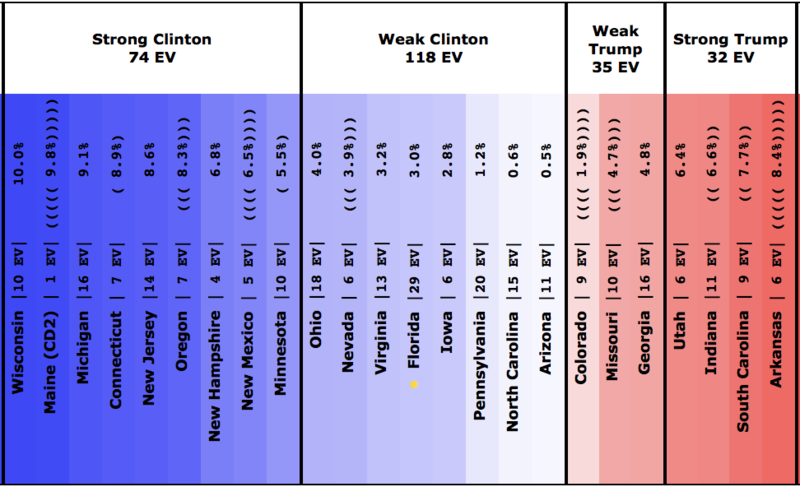 The “expected case” where each candidate wins all the states where they lead in the poll average, no more, no less, now sits at Clinton 323, Trump 215. This is a 108 electoral vote win for Clinton. We are back where we were in mid-March. With this scenario, Trump is still losing, but not by as much as either Romney (126 EV loss) or McCain (192 EV loss). So to repeat a theme I have touched on a number of times before, yes, Trump is behind here. Clinton is winning. But we are NOT seeing a historically bad Republican candidate. Trump is actually doing better than his immediate predecessors at the moment. And compared to both two months ago and one month ago, he is still up or flat on all four metrics tracked here at Election Graphs, not in the midst of and epic collapse. Or, at least, there isn’t one in evidence yet at the state level. If anything, it looks like he is still in the process of recovering from the collapse in support he did indeed see during the months the primaries were in full swing. 133.2 days until the polls start to close. 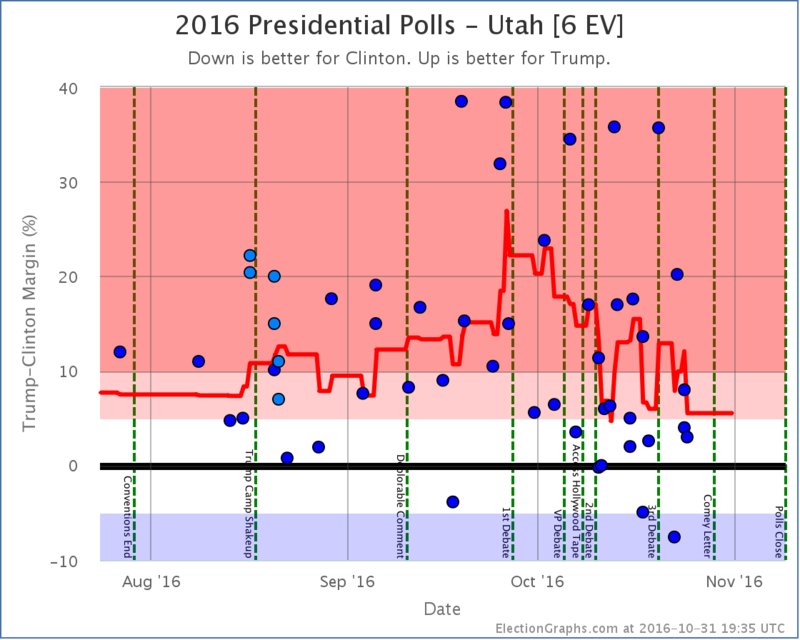 Since the last update there have been new polls in Arizona, Washington, Illinois, Iowa, Florida, Ohio, Pennsylvania, and Utah. The latest ones in Pennsylvania, Arizona and Utah made differences to the Electoral Graphs model. Two of these moves favored Trump, but one favored Clinton. We’ll cover them in order of how many electoral votes each state has. 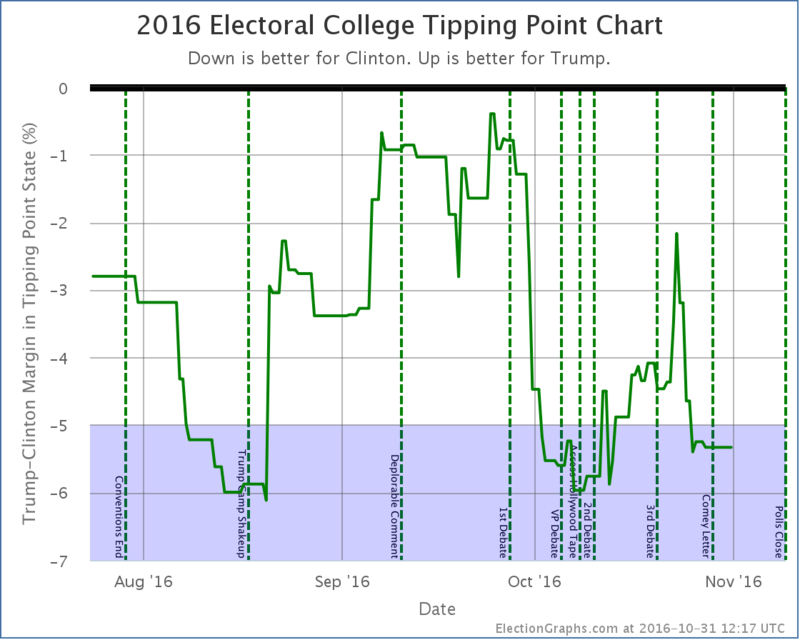 On the tipping point metric, Trump has been improving consistently since the beginning of May. This despite the continued downward trend in the national numbers. As I discussed last time, this has happened in enough states at this point that it seems like it may be a real thing. 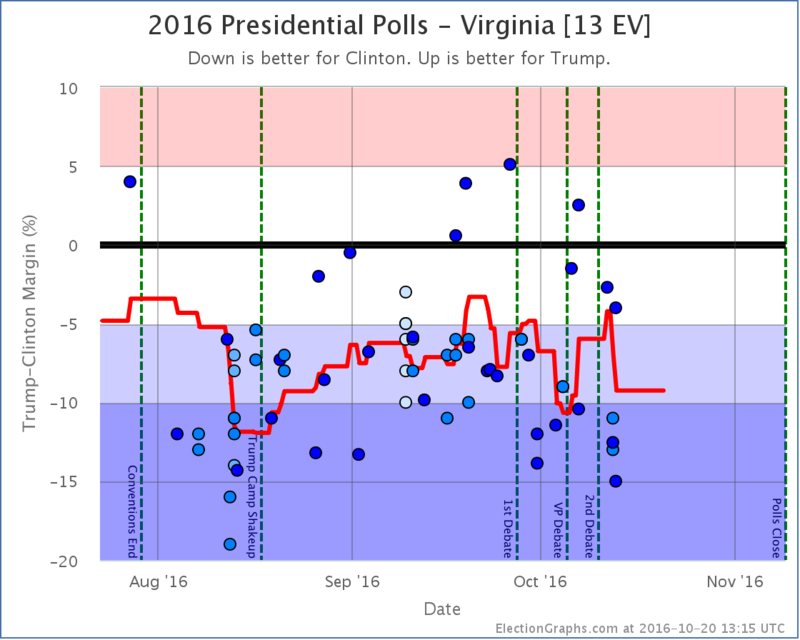 Trump is getting closer in some states, while simultaneously falling further behind nationally. 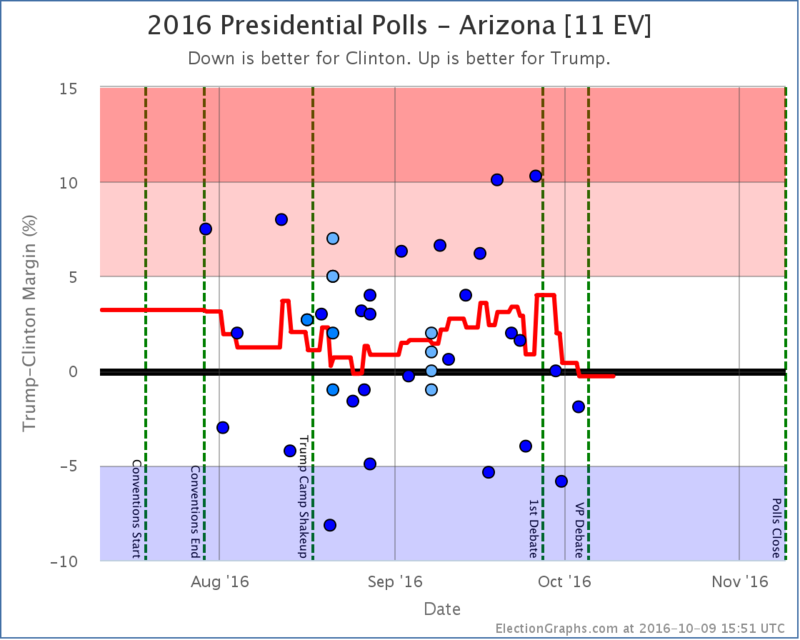 While the tipping point was moving toward Trump, Arizona has been moving toward Clinton. With the latest updates, Arizona moves from an 0.4% Trump lead to a 0.5% Clinton lead. Either way, Arizona is currently looking like a state that could go either way. 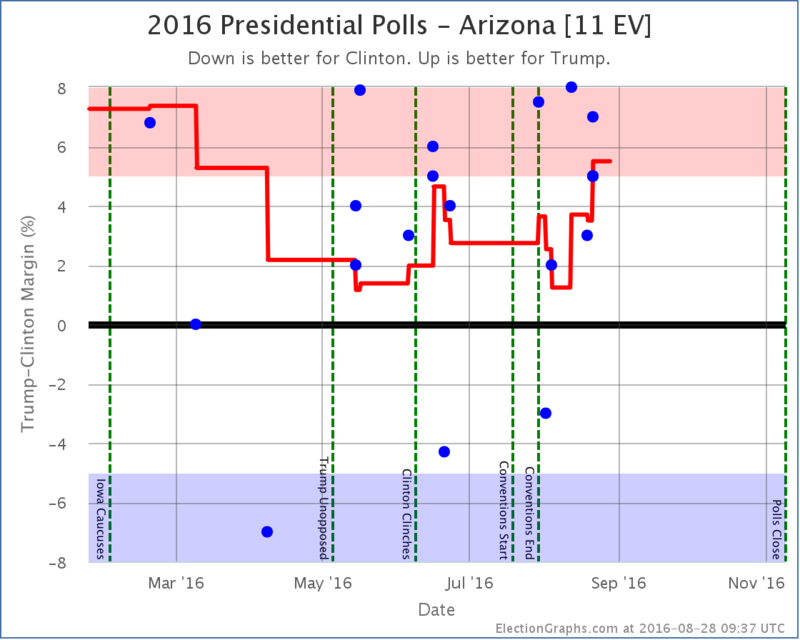 But for the first time this cycle, Arizona is now on the blue side of the line. Arizona hasn’t gone Democratic in a presidential election since 1996. That isn’t as long as a state like Utah, but it is still quite some time, and it is remarkable that the poll average is showing Democrats with a lead, no matter how small. Meanwhile, as Arizona dips into the blue, Utah, which had briefly dropped into the competitive zone, once again looks a little stronger for Trump, and thus moves out of the category that could go either way. Having said that, we’re still looking at the smallest Republican margin in Utah in many decades. Just not quite as narrow as it looked. It is hard to call a trend on this. 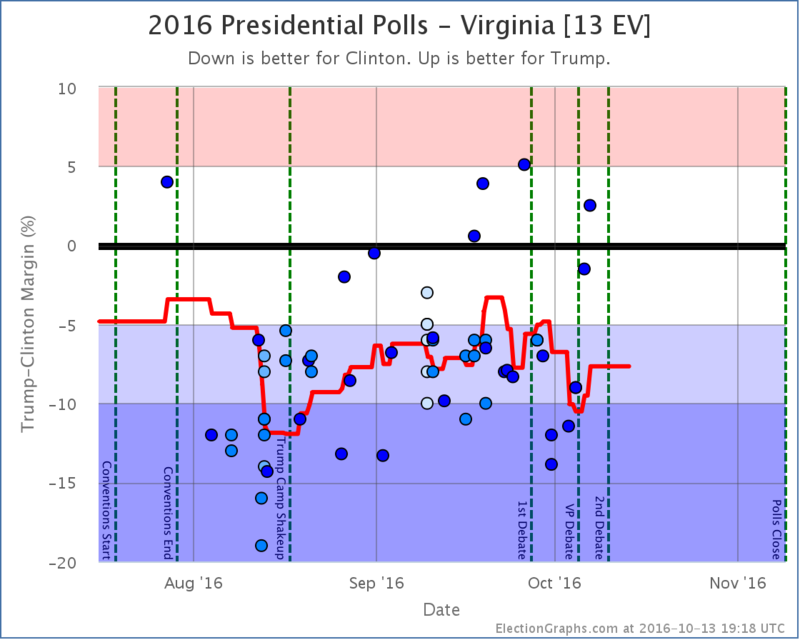 Look at the center line (the expected case) and every move since February has been toward Clinton. 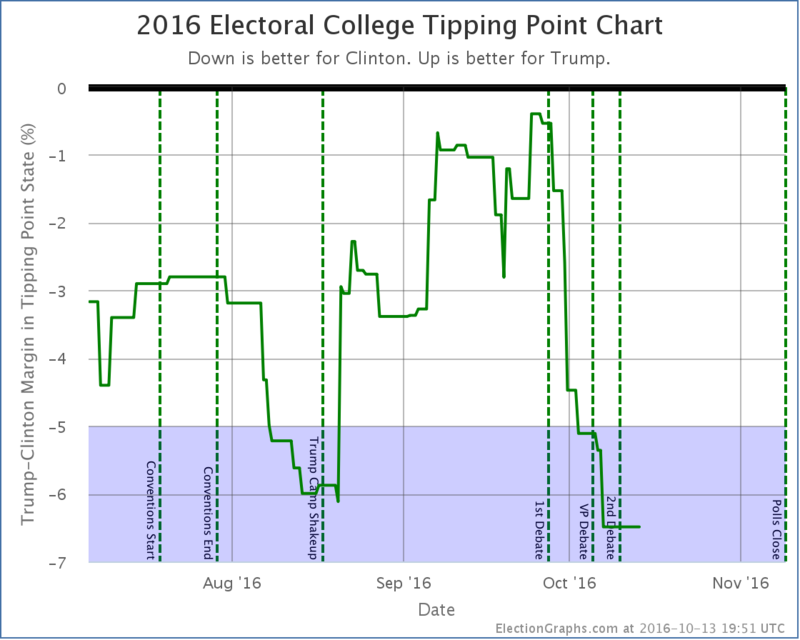 Look at the top of the bubble (Trump’s best case) or the tipping point (see chart earlier in this post) and every move since early May has been toward Trump. 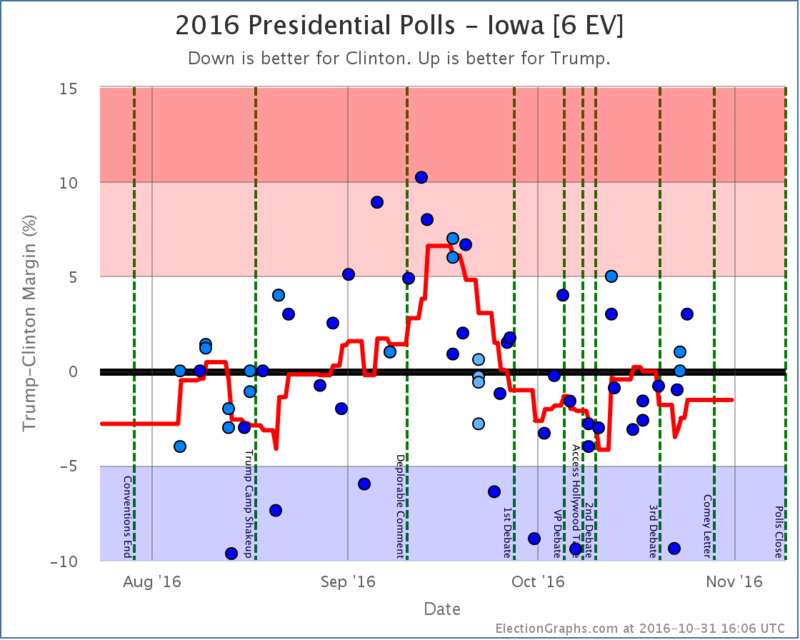 Look at the bottom of the bubble (Clinton’s best case) and things were moving toward Clinton until June, then started moving back toward Trump. 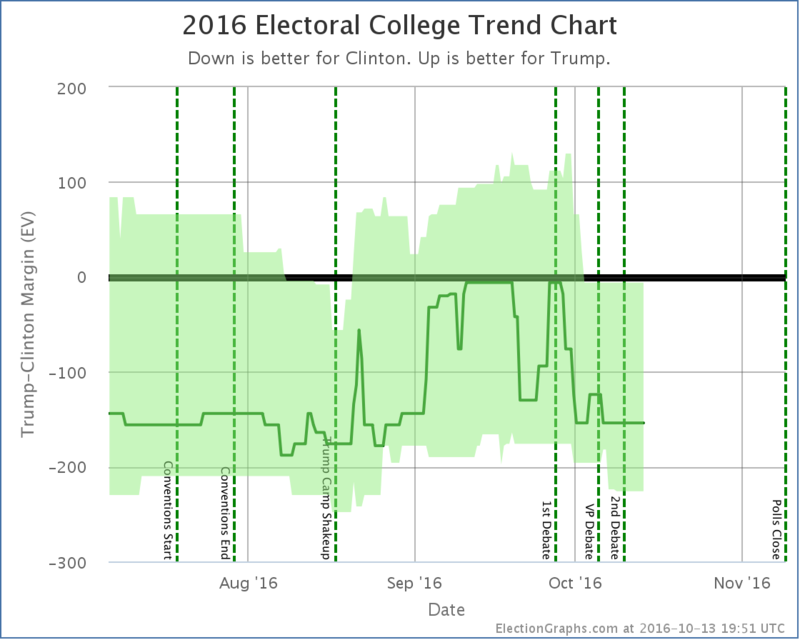 And of course the national polls have been moving toward Clinton for awhile now. So what is really the trend? Well, all of them. They measure different things. 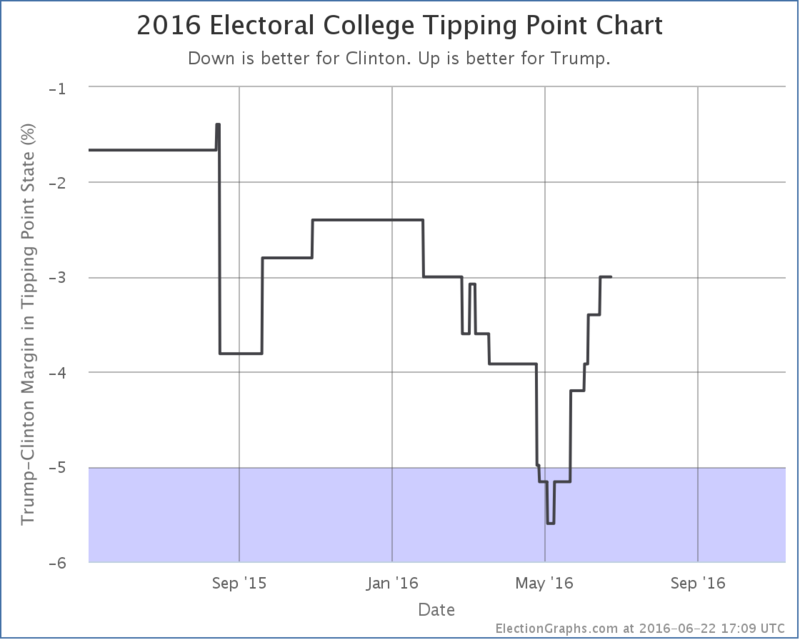 Clinton’s absolute electoral college and popular vote leads are growing. But Trump is making more states close, which means his best case is improving, and the tipping point is getting closer. 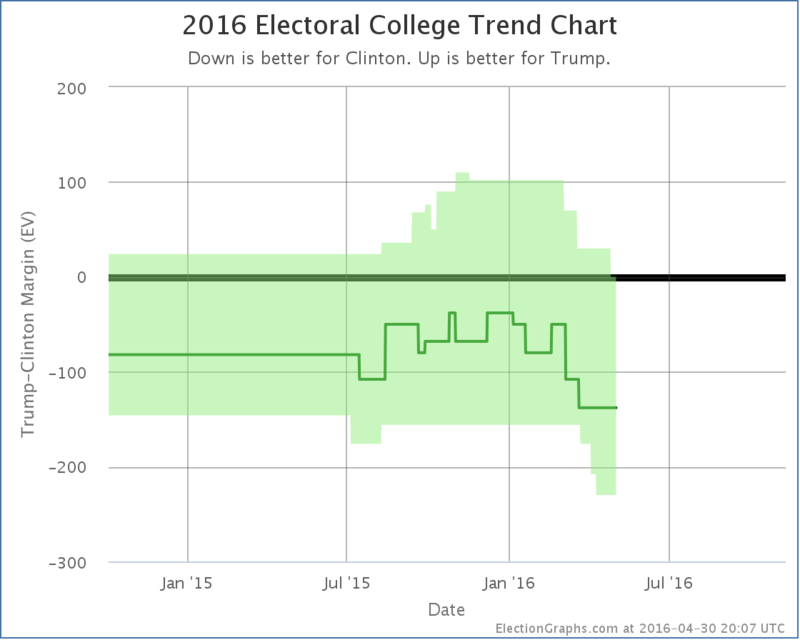 While meanwhile, for the moment anyway, Clinton’s best case may have hit a ceiling and be bouncing off it. It is more complex than just looking at which direction a single number is going. But in the end, if you have to look at only one number, it is probably the “expected” line. 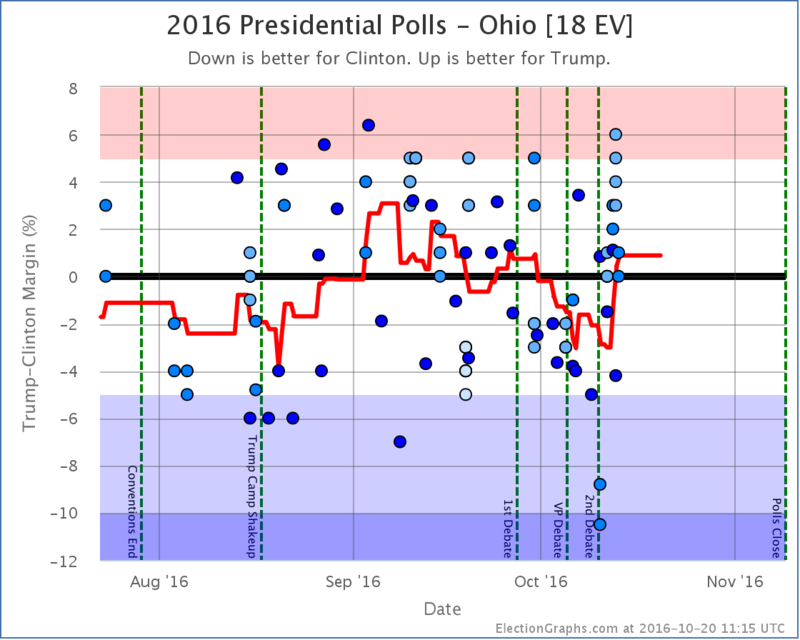 To win, Trump has to make that line move upward. It hasn’t been going that way for months, and it has never shown a Trump win. Trump has 138.7 days to change that. 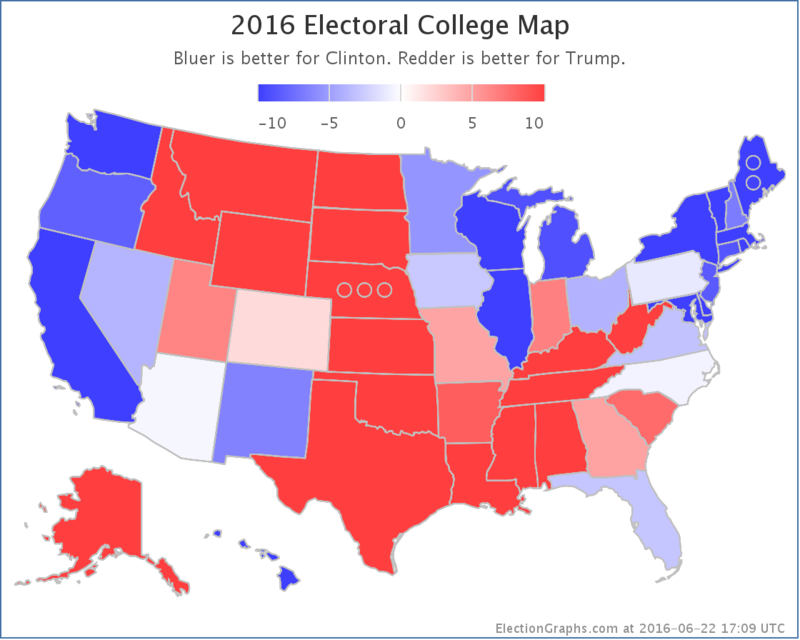 Since the last post here on the Electoral College back on April 19th there have been new polls in Maryland, Wisconsin, North Carolina (x3), Pennsylvania, New Hampshire, Indiana, and Arizona. Today the latest in Arizona and North Carolina make a difference to the ElectionGraphs.com estimates. There are two state category changes for Clinton vs Trump and one for Clinton vs Cruz. All three of these changes favor Clinton. Maybe everything is going Trump’s way in the primary campaign right now, but things are heading in the opposite direction for the general election. 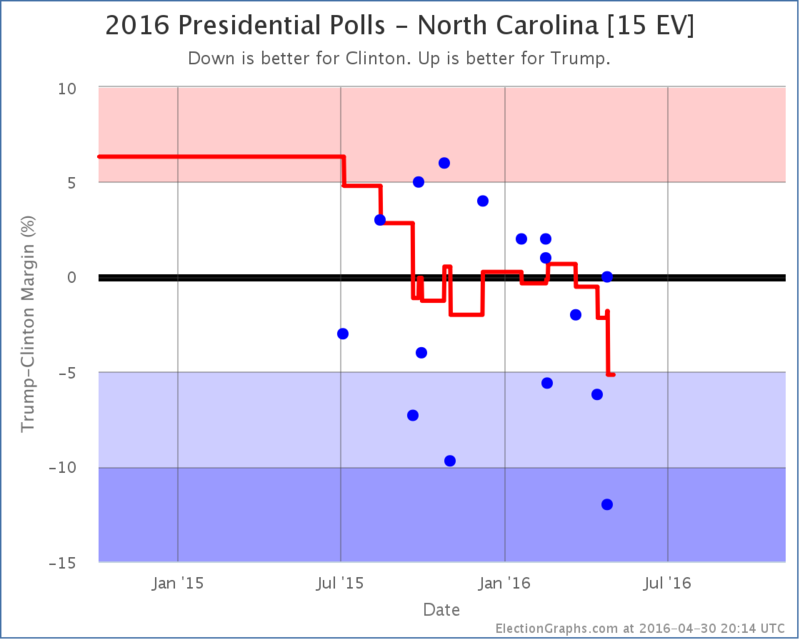 For quite a few months, the Clinton vs Trump poll average in North Carolina just bounced back and forth between Clinton and Trump. 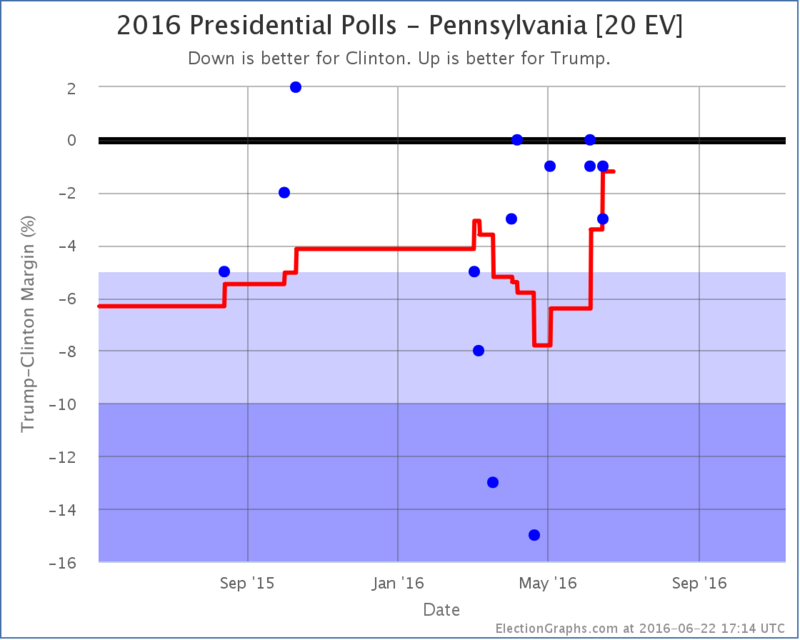 But as of now, the best Trump has done in the five most recent polls is a tie. The average has been trending downward since mid-March. The average is now a 5.2% Clinton lead. 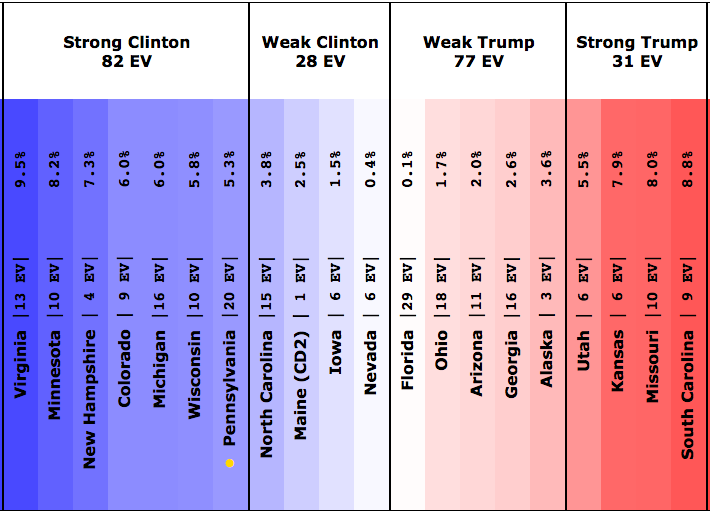 With that, North Carolina moves from “Weak Clinton” to “Strong Clinton”. 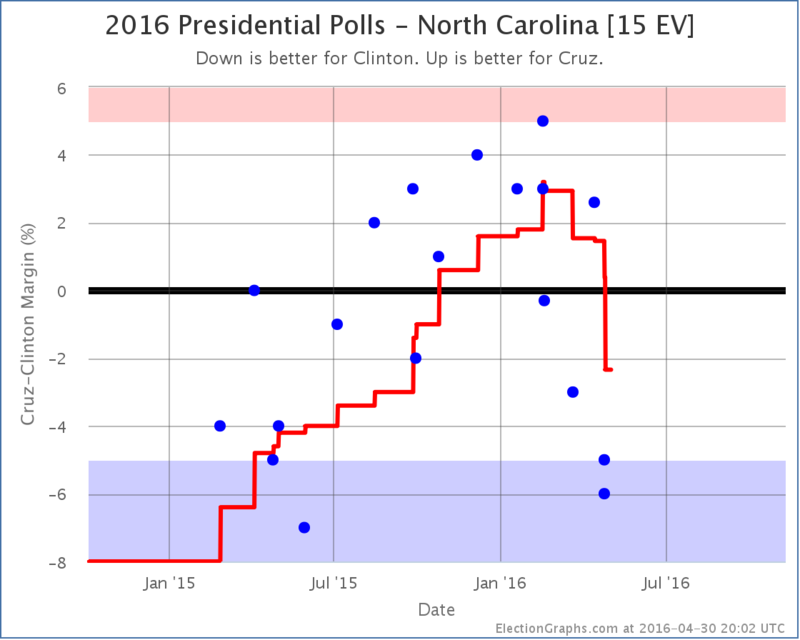 This makes North Carolina blue enough that it isn’t considered a possible Trump pick up in the model any more. Arizona has been very lightly polled. 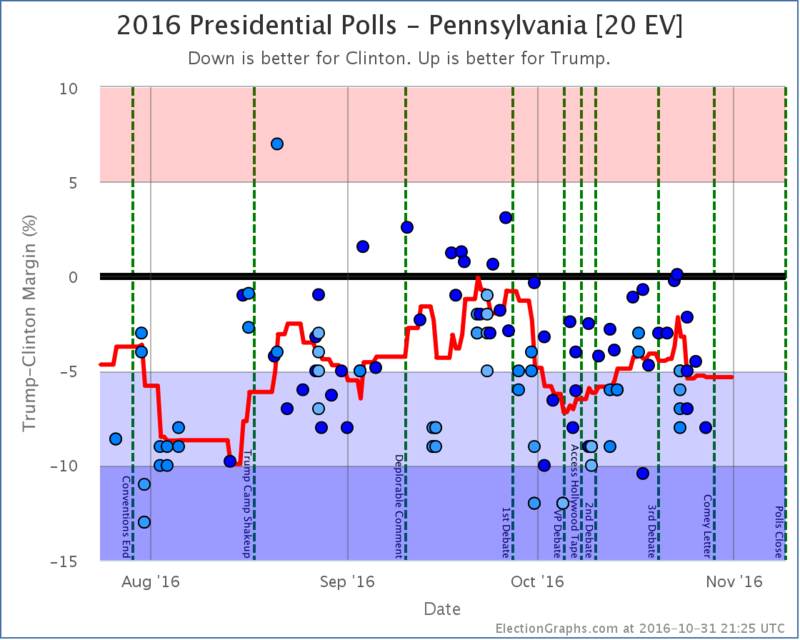 There have only been three polls of Clinton vs Trump so far. So the average still includes the 2008 and 2012 election results. 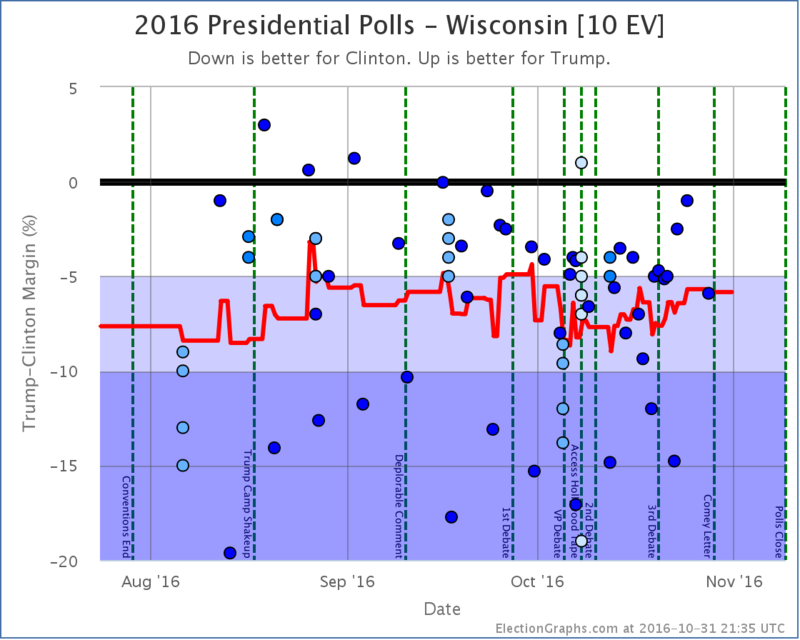 Each of the polls so far has been worse than the last for Trump though. The average now is only a 2.5% lead for Trump. 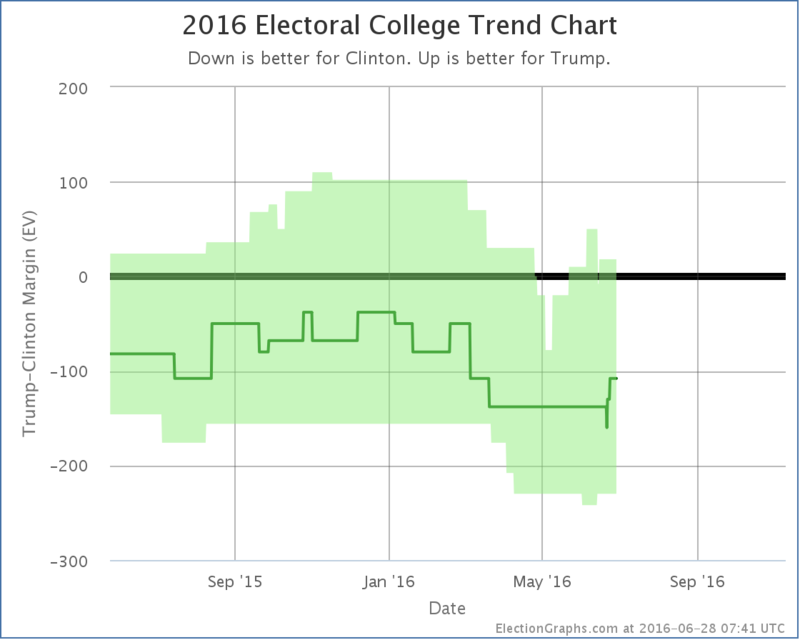 With that, it is a “Weak Trump” state that is within reach for Clinton. 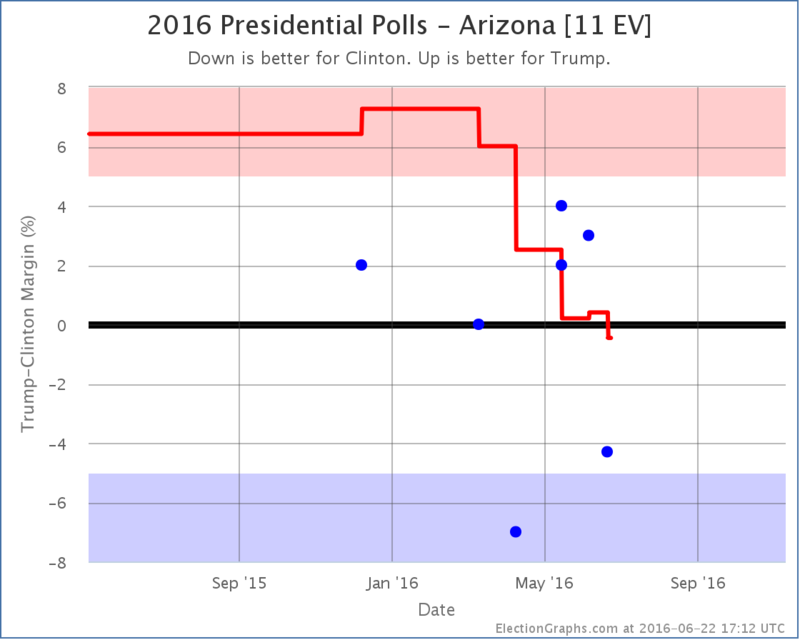 Yes, Clinton’s best case is better than it was with Arizona as a possible pickup. But look at Trump’s current best case. It is a 269 to 269 electoral college tie. Can you even imagine a Clinton vs Trump race thrown into the House of Representatives? Wow. 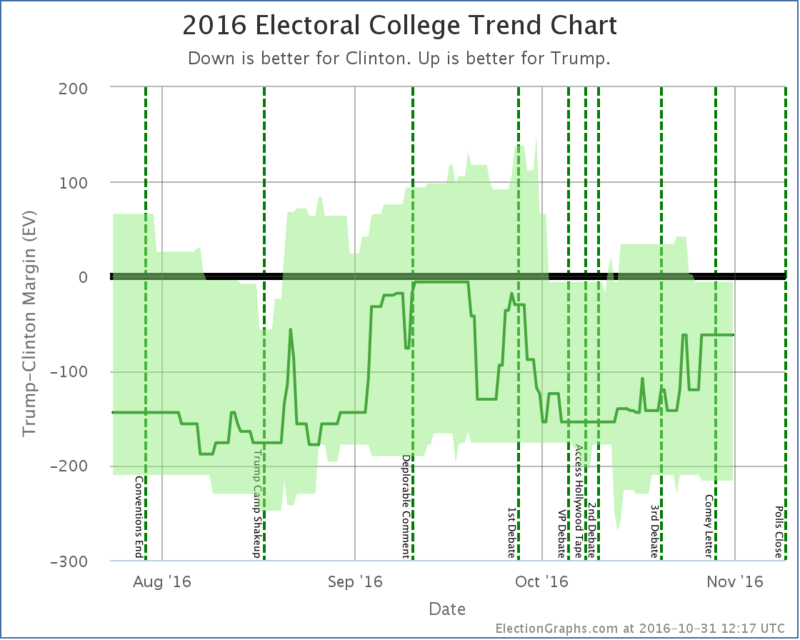 The bottom line on Clinton vs Trump is that after peaking around the New Year, Trump has been declining ever since. He is now at the point where if you give him not only all the states he is ahead in, but also the ones where Clinton is ahead by less than 5%, he only gets to a tie. Things will undoubtedly change as both parties transition from primary mode to general election mode. 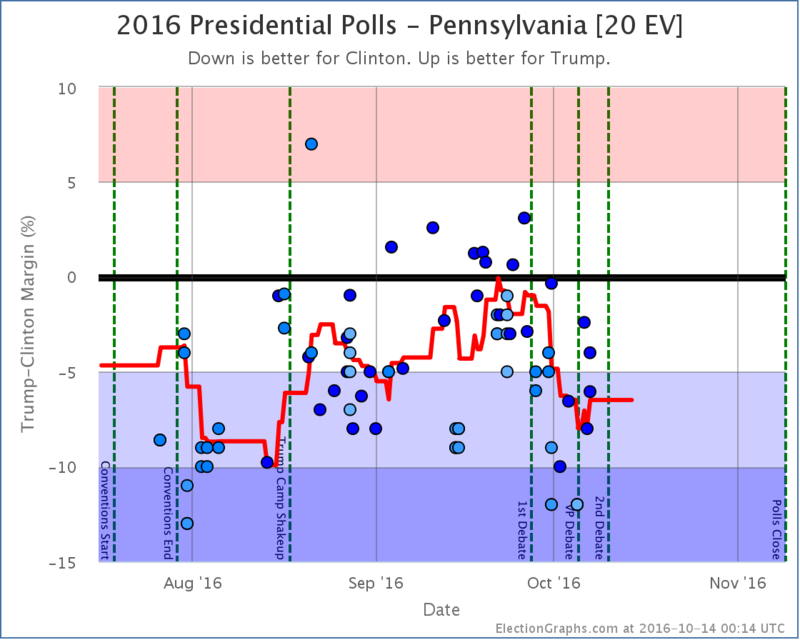 The primary season has been very bad for Trump in terms of general election polling. The types of things he has been saying and doing that are winning him the Republican nomination are at the same time souring the general election voter against him. Oh yeah, Cruz is still in this too. 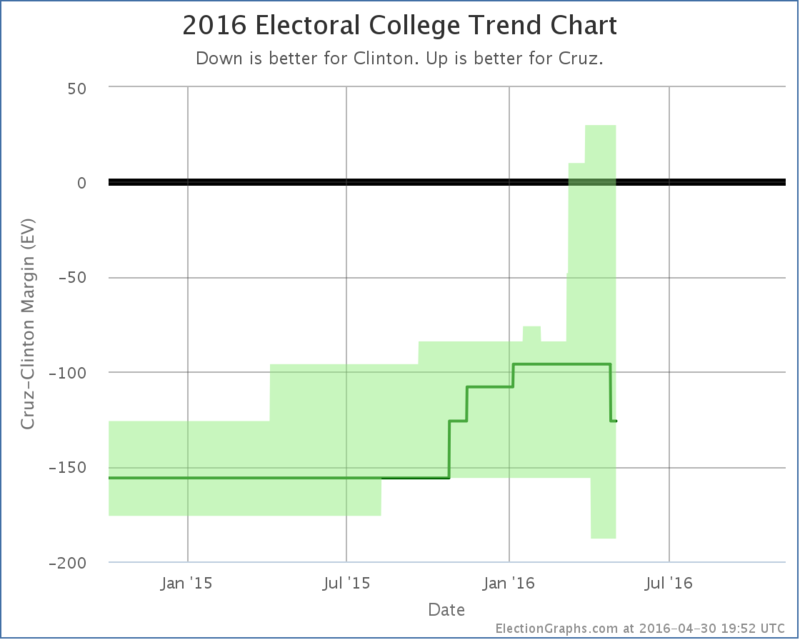 Notice that in all four of the key metrics, the expected case, the two best cases, and the tipping point, Cruz is doing better than Trump against Clinton. Of course, Trump is on track to be the nominee and Cruz is not, absent some sort of coup at the convention via a rules change, a last minute Trump implosion, or something like that. Republican voters do not seem to be prioritizing “electability” this time around. 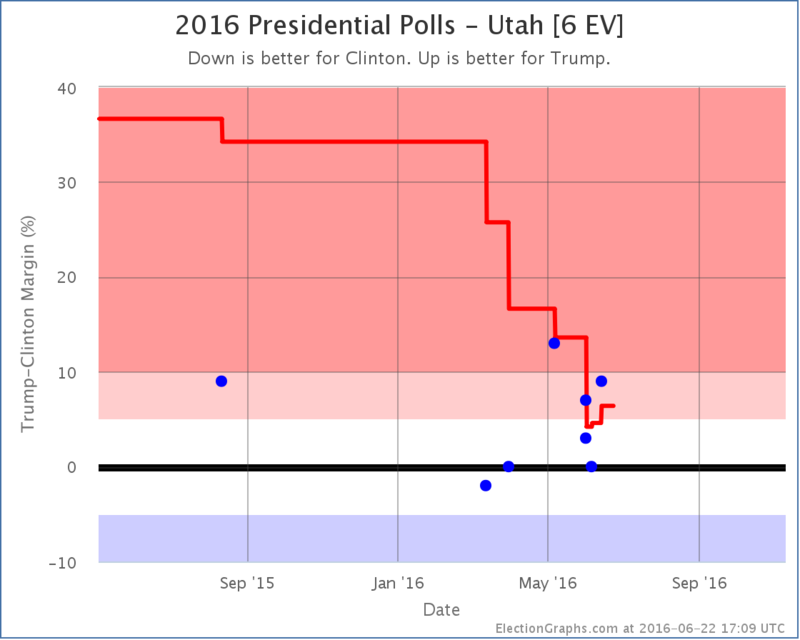 When I did my last update there hadn’t been any recent polls in either Arizona or Utah, but the results there ended up matching pretty well with the results of the few polls that came out since then. Namely, Trump won Arizona which was straight up winner take all, and Cruz got over 50% in Utah, so he got all of the delegates there. So the net for the night was Trump +58, Cruz +40. So effectively, Trump got 60.78% of the delegates since the last update. He only needed 53.07% to improve his position. 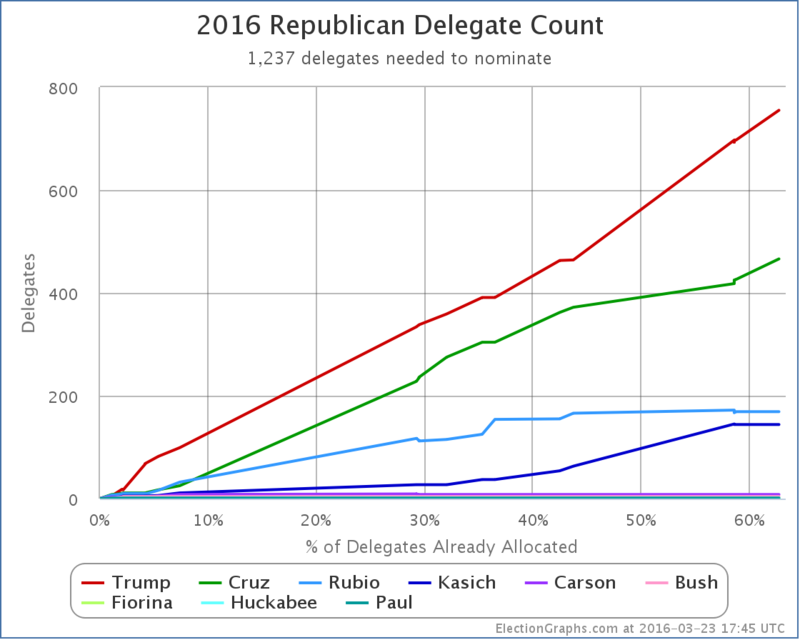 Trump’s pace of delegate accumulation actually looks like it has accelerated, while everybody else has slowed down. But the raw delegate counts are not the right thing to look at. In percentages of the delegates so far, both Trump and Cruz improved. But of course Cruz is nowhere near the 50% line. Trump meanwhile is now at 48.74%. He doesn’t have a majority. Close. Very close. But not quite. But % of delegates so far isn’t the right thing to look at either. This is the real graph to watch. 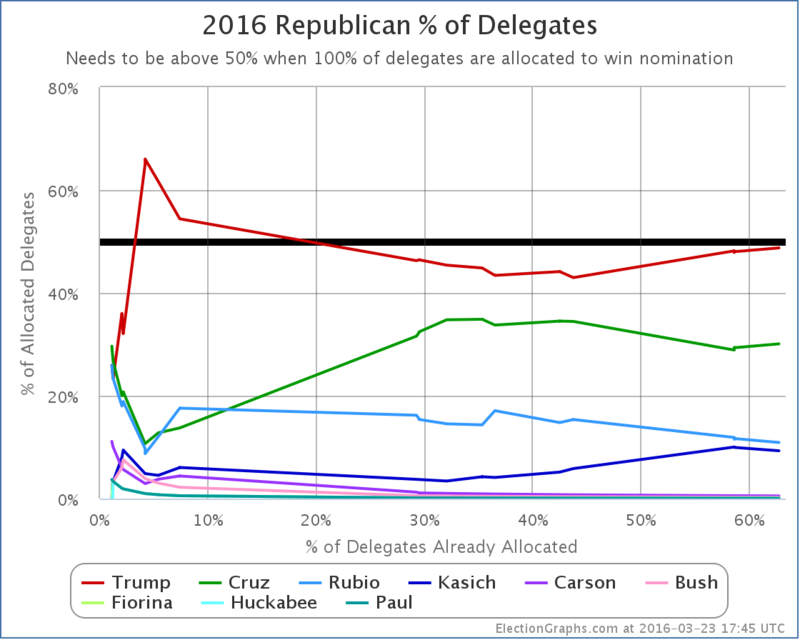 The percentage of the remaining delegates that Trump needs to win in order to get to the convention with a majority of delegates. This has been dropping in the last couple of contests. Trump now needs 52.22% of the remaining delegates to win the nomination outright. Now, some of those “remaining delegates” are 18 delegates who have already been selected as officially “uncommitted” delegates, and there will be more uncommitted delegates coming out of some of the states that have yet to vote. Probably a few dozen to as many as 100. These delegates are essentially like the Democratic superdelegates in that they can vote however they feel like and are not bound to the results of any primaries or caucuses. If you wanted to calculate the percentage Trump would need without uncommitted delegates, it would be higher. But just like superdelegates are part of the process on the Democratic side, uncommitted delegates are part of the process on the Republican side, and to get a fair picture you need to include them. You just have to realize that winning not only includes earning pledged delegates, but also convincing uncommitted delegates to vote for you. 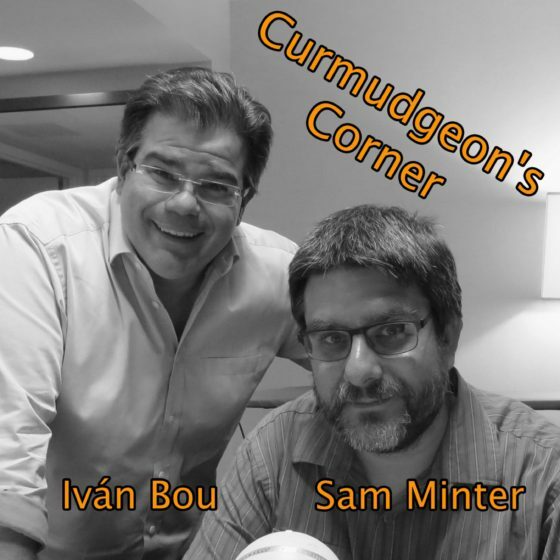 It is a real possibility that we could get to the end of the primaries and caucuses in June without knowing if Trump has an outright win, or if he’ll come up short on the first ballot at the convention. It might end up depending on what those uncommitted delegates decide to do. We are still right on the edge between a Trump win and a convention where nobody wins on the First ballot. And which way that goes may end up depending on the uncommitted delegates. 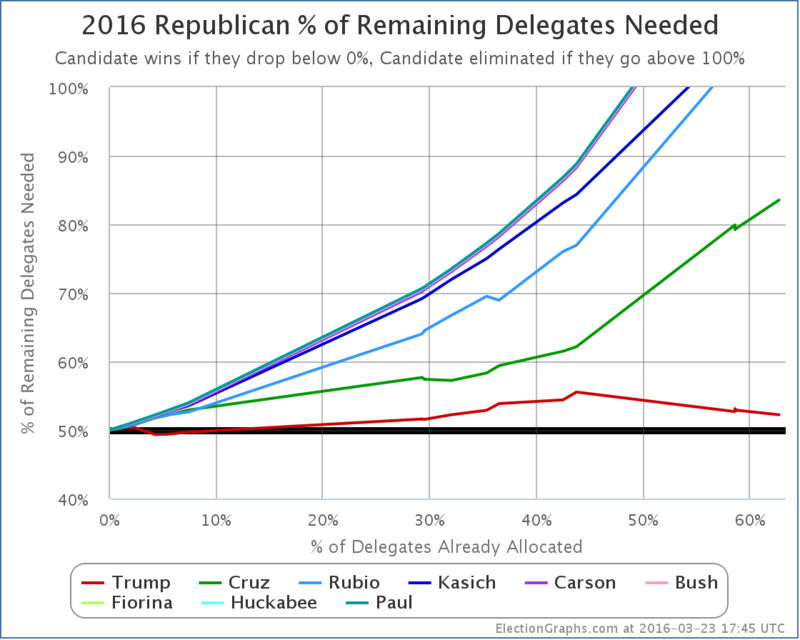 What percentage of the uncommitted delegates Trump would need… if he even needs them at all… will depend on how he continues to do in getting pledged delegates between now and June. But meanwhile, the pace of primaries and caucuses now slows down quite a bit. So there will be a lot of waiting before we know.